Review summary A beautifully designed exercise bike with a small desk where it allows you to do work and be productive while being active. This product was given the 2018 CES Innovation Awards. Imagine being able to get in a full-on workout while still being able to finish all of the work you need to complete within one timeframe. Imagine being able to be productive and not feel completely drained afterwards. 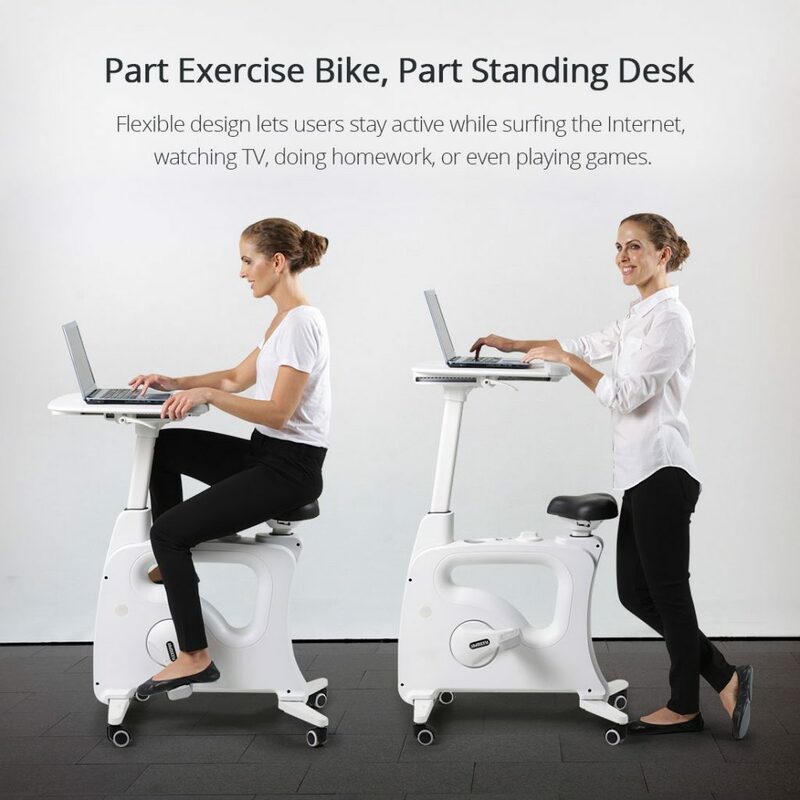 Unlike many stationary bikes that also function as a work space, this particular product looks very beautiful in it’s design, just as much as it is functional. Not only will this product work well in any modern home, it looks great as well. This makes it much easier for you to leave it out and use it at any time. 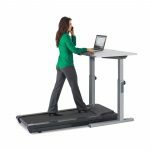 The Deskcise Pro is a product made by FlexiSpot, a brand that puts the customer first in everything they do. They do make many other beneficial products, but this particular product is our focus today, not only because of how functional and versatile it is, but also because it’s a customer favorite. When reading through this article, it’s important to imagine how this product would play a role in your lifestyle. How would this product change how you live your life currently? Do you think you would benefit from how unique this product is. This article will hopefully help you better understand what you want out of your workspace and fitness aspects of your life. Below we’ll be covering the highlighted features so you can get a better feel of the product. 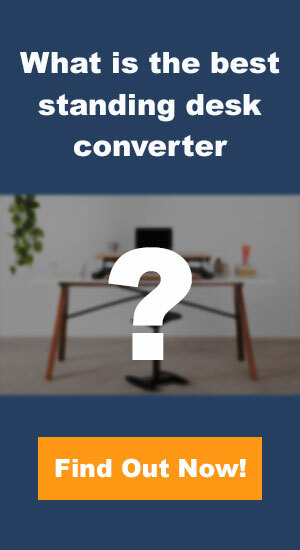 If you like what FlexiSpot has to offer, you may want to check out their stand up desk converter. You want boosted focus: This product will help boost your focus, no matter what age. Even when it comes to children you can use this as a fun way to motivate them to complete their homework assignments. You want to improve sleep: When you’re more active throughout the day and put that energy into your work, you’ll have a much more easier time getting to sleep when you lay down in the evening. You want to feel energized: This product will help you really increase your energy. For many people it will help you feel energized without wasting that energy in any way since you’ll be able to put that focus into your work in front of you, all at the same time. You want sleek design: This specific product is such a fan favorite not only because of how useful it is, but also because of the sleek and minimal design that really stands out in a very beautiful way. You want more possibilities: Even if you still want to go to the gym, using this product is a great way to add just a little bit more to your routine, without any time wasted whatsoever. You become distracted easily: If you’re someone who usually gets distracted easily when you’re being active and in motion, this probably is not the best product to invest in if you don’t plan on using it for work. Your doctor does not approve: If you have health concerns, you should speak to your doctor before you try exercising with this product. This product could be too much for you if you have a sensitive health system. You rely on more activity: If you need to take part in more activity and muscle training, this isn’t always the best kind of workout to dedicate long amounts of time to. You don’t work from a desk: If you don’t usually work from a desk space, this probably isn’t the most ideal product for you. You need more space: If you constantly are going through various materials you need to have with you when working, this might not be the best workspace, just because of how limited the table top area of this product can be. It should really only be used for a laptop or tablet, as well as more confined work materials. Not only will you be able to exercise and work at the same time, but you will also be able to have some control over your exercises and how they work for you. You’ll be able to customize how you want your workout to flow by changing the tension resistance on the product. The adjustable magnetic tension resistance allows you to change the resistance up to eight different settings, ranging from easy to more difficult as the numbers go up. This way you can completely change how your workout is going if you want more of a challenge. The FlexiSpot desk bike allows you to adjust the seat height to make the exercise more comfortable and while using the desk tray and giving you an easier and more natural feel. This custom adjustment might seem simple, but it really does change what you’re able to do with this product. There are also different positions for the work tray, while it doesn’t angle in degrees, it does slide forward and back to help with finding the right comfort for you. 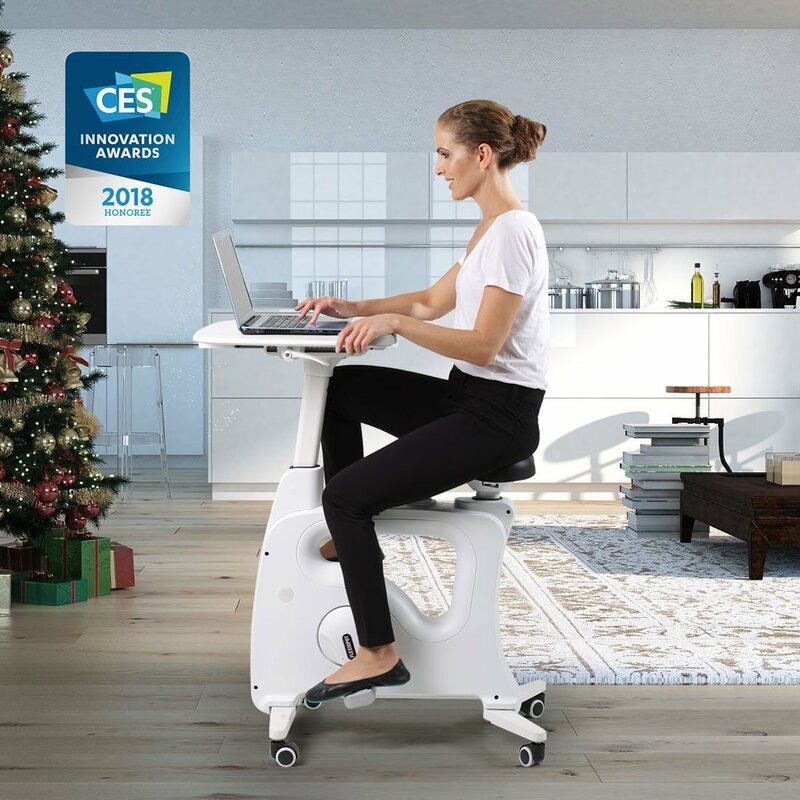 With the fully customized exercise bike, you’ll also be able to transform this to a standing desk, which is great for those that want to continuously stay active. There are many benefits of working while standing, and having a bike that can transform like that is an added bonus. This product is completely quiet, meaning you will be able to have this product in an office space with permission and it won’t cause any distraction or annoying belt noises each time the product is used. This means that you’ll also be able to exercise on this machine without focusing on the pedaling itself. You’ll be able to focus on your work and tune out the fact that you’re actually exercising. 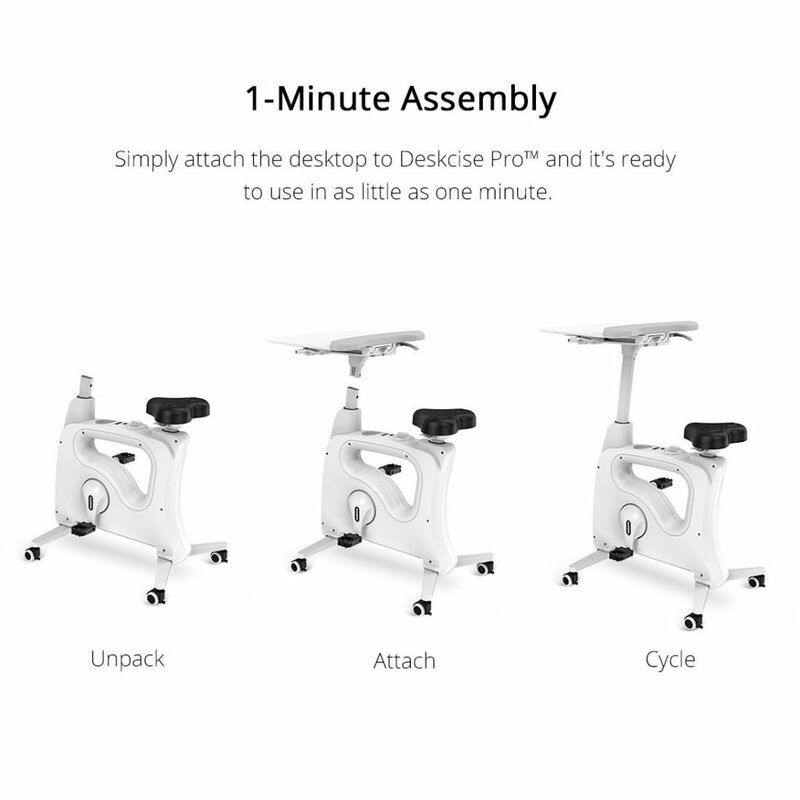 FlexiSpot Deskcise Pro is almost fully assembled, as soon as the box is delivered, you can take it out of the box completely and with a quick 1-minute assembly, you’ll be on your way to having a healthier work environment. You don’t need to assemble any hard parts, just simply unpack, attach, and then cycle! The FlexiSpot company has gone above and beyond to make sure that your experience is put first. They know that if you purchase this product, you want to start using it as soon as possible and start burning calories. This product is extremely easy to move anywhere you need to store it. It can be rolled because it has four high quality wheels that can swivel in any direction, which allows you to move this product anywhere. Also because it’s quite small it shouldn’t be difficult for most individuals to move with ease. The star of the show when it comes to features would have to be the modern design. This design is clean, futuristic, and beautiful. It can blend in with any environment, and it makes it easy to blend in even in a non work or gym setting. The FlexiSpot Deskcise Pro is a fantastic product, it can bring a sense of design and structure to any space and it’s an investment that will quickly pay off. It’s a product that will provide you with the motivation and energy you need to power through your day. This product is most ideal for those who want to help their health increase in a positive way, as well as a way to multitask while feeling focused. When you use this product daily, you’ll notice a difference in the rest of your day. Would you like to try out this product for yourself? Let us know by sharing this review and commenting, we’d love to know your thoughts and if you plan on making an investment that could change your life.